You don’t need me to tell you that there will be action galore this weekend, with the running of the Breeders’ Cup this Friday and Saturday at Santa Anita. Let’s take a look at how the action shapes up from a tournament perspective here at HorseTourneys. The Friday and Saturday tourneys will be based on the full cards at Santa Anita each day. The races in Sunday’s tourneys are yet to be determined. As always – included as part of their entry fee — tournament contestants will receive free Brisnet PPs for all the races in their contest. Now let’s take a deeper dive into the three days. Friday’s headliner is the $12,500 Guaranteed live-format tourney with $6,250 up top for the winner and prizes down to 6th. Entry fee is $195. There will also be a slew of supporting tourneys focusing on the Breeders’ Cup Friday card. We’ll have $1,500 tourneys at price points of both $69 and $12. There will be $500 tourneys in both live and Pick & Pray formats with entry fees of just $12, plus a $500 exacta box tournament for $55 limited to 10 entries total. And we’ll have a $500 Survivor tourney that you can enter for only $7. 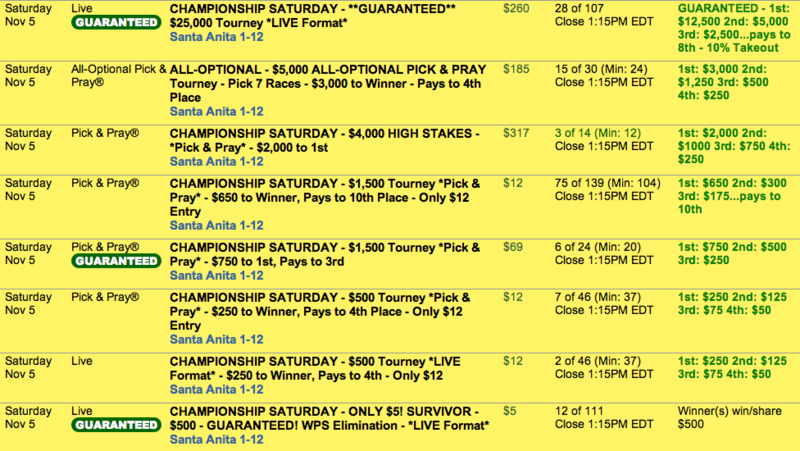 Also offered are winner-take-all tourneys paying out $250, $500 and $1,500 – each in both live and Pick & Pray formats. Even better, the $500 and $1,500 winner-take-alls will pay all participating players 4.5% rebates. Last but not least, Friday will also offer feeders to virtually all of the major Saturday and Sunday tourneys. If you think Friday is big, have a look at Saturday. We, of course, have that $25,000 guaranteed game on Saturday for $260 with $12,500 to the winner and prizes down to 8th place. We’ve also got a creative $5,000 All-Optional tourney where you pay an $85 entry fee and play seven of the 12 Santa Anita races on Saturday. So you can cherry pick your best plays or skip the first five and save all of your bullets for the end. There’s also a $4,000 high stakes game where entries, at $317 each, are capped at 14. And $1,500 tourneys at both the $12 and $69 entry fee levels. Or how about a $500 tourney for just $12 with prizes down to 4th? We’ll have these in both live and Pick & Pray formats. Specialists will enjoy our $5 Survivor game with the winner(s) sharing $500. But there’s a lot more where that came from. Plus there are $1,500 and $500 exacta box tourneys. The $1,500 one is guaranteed, so be alert for an overlay there. There will be five-person, All-Optional tourneys (again picking 7 of 12 races) with 4% rebates offering winner-take-all prizes of $500 with just five players allowed. Plus live and Pick & Pray winner-take-all games encompassing all 12 races at the $250, $500 and $1,500 prize levels. For seat hunters, there are two big direct qualifiers Saturday – one for the Horse Player World Series ($87, one winner per 20) and one for the Twin Spires Online Championships ($58, one per 15). These are are “Last 6 races” tourneys on Saturday. They are fun tourneys in and of themselves, of course, on some of the year’s very best races. But they have added utility. If you happen to get off to a slow start on Saturday, they are a chance for a fresh start on Santa Anita races 7-12. Or, if you are doing well in your existing tourneys, this could be an opportunity to hedge your main tournament plays. Fittingly, there will be six “Last 6” tourneys. Five are cash games at prize levels between $250 and $500. One will be a feeder to the following day’s NHC qualifier. A smart tournament player once told me that the day after Breeders’ Cup is his favorite day of the year because so many of the other strong tournament players aren’t in action that day either due to travel or fatigue. Based on that logic, you’ll definitely want to play in Sunday’s NHC qualifier (live format) for $160. Two NHC spots are guaranteed, and we’ll hand out four if we get 280 entries. Finally, there is a direct qualifier on Sunday to the Nov. 25-26 Hawthorne Fall NHC Super Qualifier. Winners (one per 15 entrants) will receive two-day entry fees ($700 value) plus $500 for travel expenses. We wish all of you a memorable and profitable Breeders’ Cup. And we send out extra special wishes to Dan Flanigan, Larry Burns, Tony Zhou, Michael Caposio, Gary Johnson, Kevin McIntyre, Pete Acocella and Eric Moomey. These eight outstanding tournament players were our top eight finishers at The BIG One and will be representing HorseTourneys at this weekend’s Breeders’ Cup Betting Challenge. Bring home the big money, guys. And again, good luck to all!